BAE Systems develops, manufactures and supports some of the most complex machines that exist anywhere on the planet. We have businesses in military aircraft, warships, nuclear submarines and cyber security systems in the UK. With a longer term view of our business, the critical feature of our future planning is our skills planning. This includes BAE Systems recruiting in the UK this year 387 apprentices (including 31 higher apprentices) and 274 graduates. This is the largest number of apprentices the company has recruited for over 5 years and represents the key role that apprenticeships play in underpinning critical engineering and manufacturing skills in the company. Providing up to 50 additional engineering apprentice training places at our Preston Training Centre for companies in our supply chain and the wider engineering and manufacturing sector in the North West. We have a great apprenticeship programme in which we have invested over a number of years and are keen to make this available to the benefit of our supply chain. Offering 104 summer internship placements for undergraduates and graduates with the company this summer. In the current economic climate graduates often struggle to get relevant high quality work experience before they leave university and this makes it difficult for them to get their first job. We hope that by providing this experience we can build that bridge to their first step on the career ladder. Working with the Prince’s Trust we will deliver 16 work placements this year, and a further 16 next year, to young unemployed people on the Trust’s Team Programme as part of our apprentice training programmes at Barrow, Portsmouth and Preston. The young people will be given an appreciation of engineering skills, which we hope will enable them to get employment in our sector. 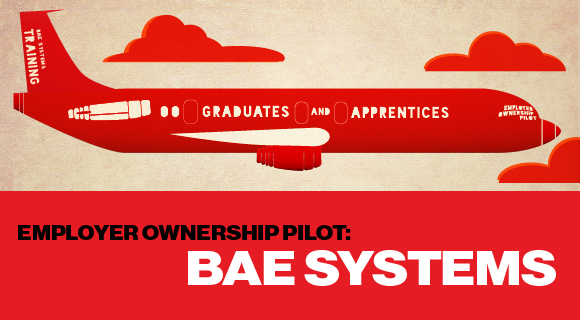 BAE Systems believes that the Employer Ownership Pilot presents a great opportunity to invest in the future skills of its supply chain and young people and would recommend it to other employers as a great vehicle to improve skills in their companies and their wider sectors.